Support the Garden! If you would like to support the Remembrance Garden please click the Donate button below. Donations can be made via PayPal using your Paypal account or credit card if you do not have a PayPal account (note Paypal deducts a 2.9% + 0.30 processing fee from your donation). Checks are also accepted (see mailing info at the Remembrance Garden link). 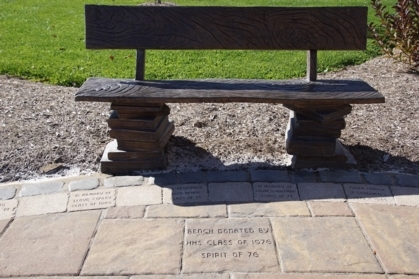 Spirit of '76, we hope to dedicate our Bronze Bench at the Hampton High School Remembrance Garden, during our 40th Reunion. Please contribute to this beautiful bronze bench. Over $5000 raised so far - we are almost there!! Make checks payable to "Hampton Alumni Remembrance Committee". Many thanks to the 40th Class Reunion Planning Committee, classmates from across the nation who have met over a year to plan a memorable event for our class! Join the proud alumni ~ Remember our classmates! Over $5000 raised so far! Donate now! Just one click away! There is an exciting program underway to honor Hampton alumni and community members who have passed away. The Hampton Alumni Remembrance Committee is the brainstorm of the Class of 74 who are currently planning their 40th reunion this summer. The Committee has been formed and includes alumni from various classes along with school district personnel. The first goal of the committee is to create a Remembrance Garden at the high school to honor these Hampton classmates who have passed away. We are hoping that all of you will join in and participate in this wonderful permanent tribute. A few members of the Class of 76 Reunion Committee met on January 23 to discuss our possible role (as a class) in this project. Make a donation by clicking the 'Donate' button in the Donate box on the right side of this page! Hampton Remembrance Garden – click (link on left)for more information! Facebook users: If you are accessing the Class of 76 web site from facebook (using the Class Connection app), you will see the donate module at the bottom of the "What's New" page and the Remembrance link under the "Class Links" dropdown. Thank you to everyone who attended our 35th Class Reunion back in October 2011! The links are still active (see tabs at left) to view photos and videos from the weekend! It won’t be long until we’re planning for our 40th Reunion!! Welcome to the Hampton High School Class Of 1976 web site. We hope this site becomes a tool for many of you to reach out and connect with long lost friends.